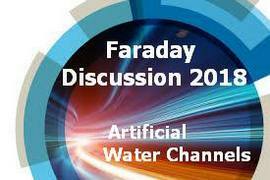 This Faraday Discussion will focus on chemistry, physics and material sciences contributions toward the rapidly evolving field of Artificial water channels. The development of synthetic biomimetic artificial water-channels and pores contributes to a better understanding of the natural function of protein channels and could offer new strategies to generate highly selective, advanced materials for water purification systems. 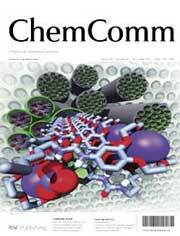 Despite the imaginative work by synthetic chemists to produce sophisticated architectures that confine water clusters, most water channel based work has been conducted with natural proteins channels as the selectivity components, embedded in the diverse arrays of bio-assisted artificial systems. These systems combine natural proteins that present high water conductance states under natural conditions with artificial lipidic or polymeric matrixes. Experimental results have demonstrated that natural biomolecules can be used as bio-assisted building blocks for the construction of highly selective water transport through artificial channels. A next step to further the potential of these systems was the design and construction of simpler compounds that maintain the high conduction activity obtained with natural compounds leading to fully synthetic artificial biomimetic channels. Such studies aim to use constitutional artificial desalination membranes for highly selective water transport to select functions similar to the natural structures. Moving to simpler water-channel systems offers a chance to better understand mechanistic and structural behaviors and to uncover novel interactive water-channels that might parallel those in biomolecular systems.